I've never really planned, or built, a really large industry before. Paper mills are seriously big, and there is quite a bit of space in South Halleluja on the Silicon Valley Lines layout. 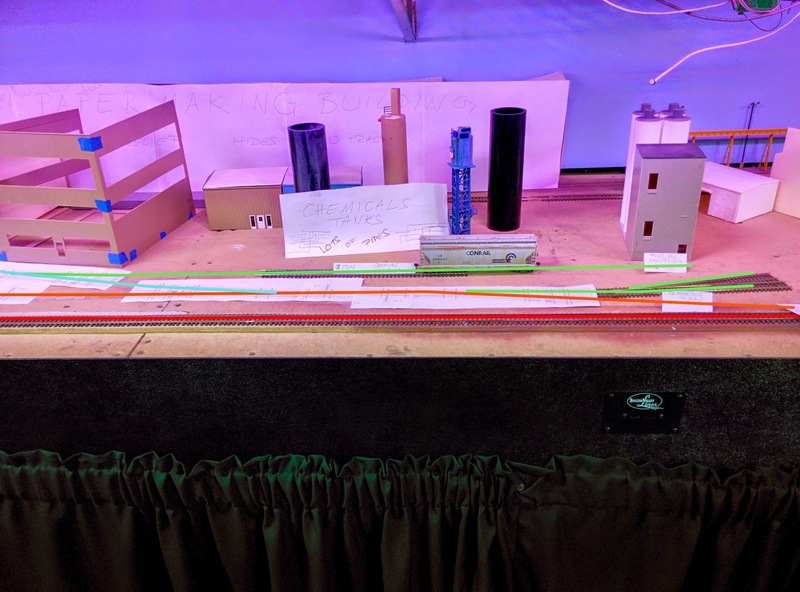 While we toyed with the idea for a while, I figured it would be useful to plan tracks and building arrangements on the layout so we'd get a better feel for the available space, what works, and what doesn't. 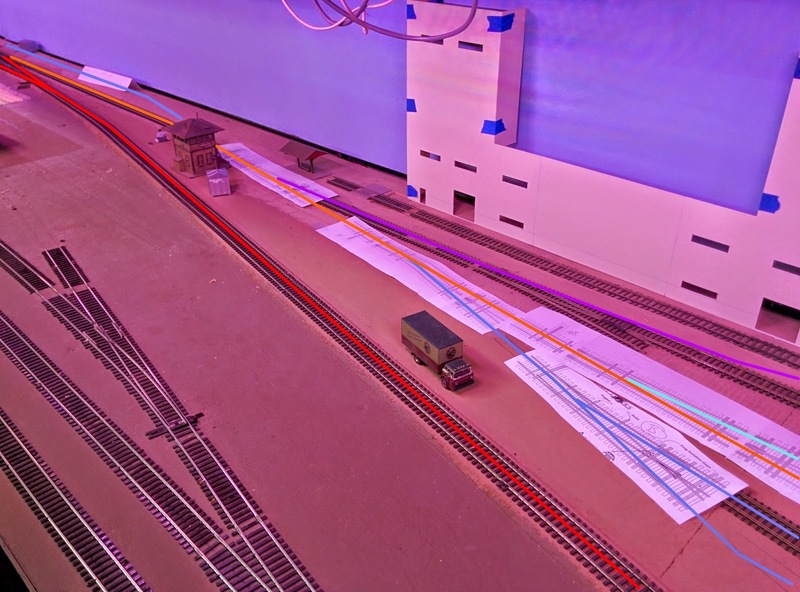 I used pieces of flex-track and printed out templates of #8 and #6 turnouts to lay out the tracks. On the right will be the pulpwood yard, next to it a warehouse for pulp and recylced paper. The big white building in the back is where the paper making machine is located. The various tanks in front of hit will hold chemicals, as well as fuel for the onsite power plant. The brown building will have offices, and the large building behind it is the finished paper warehouse. There is a small yard in front of the finished paper warehouse on the left in the photo above. Due to space constraints we're likely not going to model a truck loading ramp for finished paper, but there might be sufficient space to have one at the recycled paper warehouse. In either case, if not modelled it's assumed there is track loading on the "other" side not visible from the aisle. 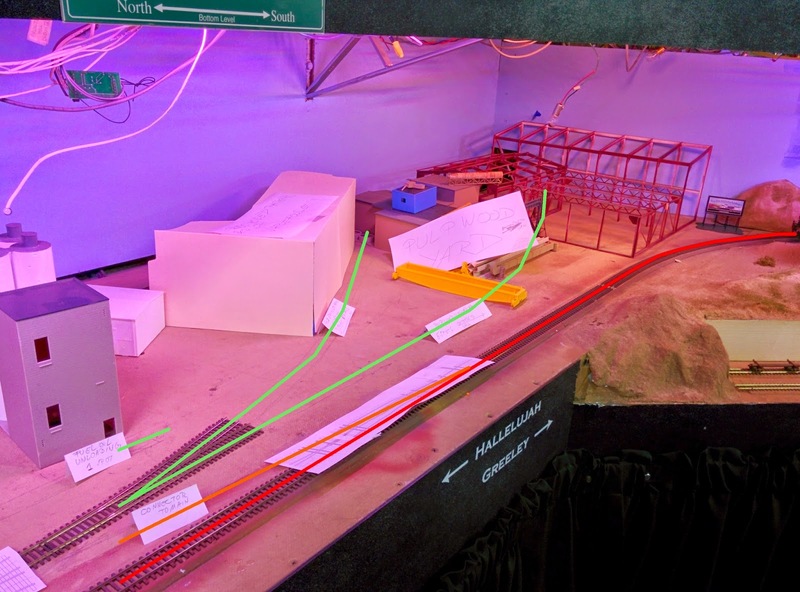 The idea is to operate the plant with one or two trains per session, and the mainline needs to be free while the mill is being worked. I colored the tracks in the photos by their respective function. In the photo above, the SVL main line (red) runs northbound into the distance. The paper mill is on the east side of the main line. Trains can enter the mill area from the North on the arrival track (orange), as well as from the South (see below). The turquoise tracks serves as run-around, as well as access to the various loading/unloading tracks (green). 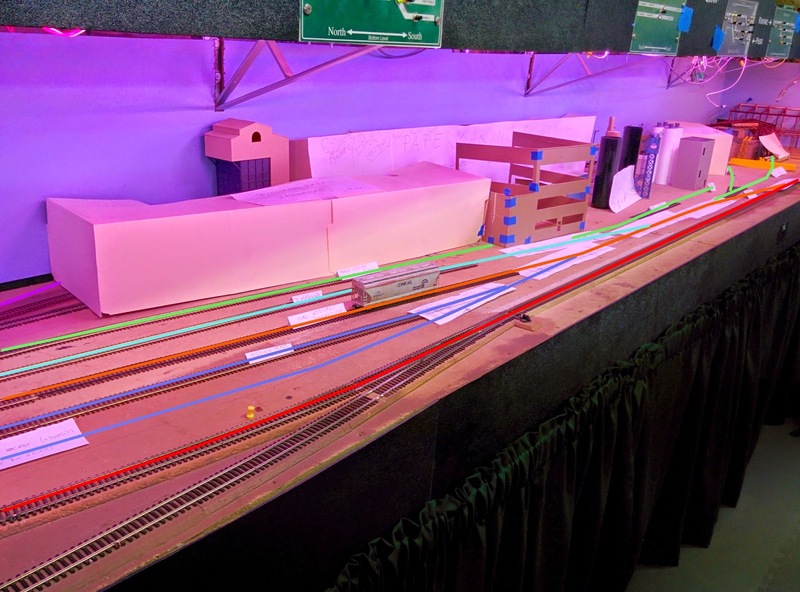 The yard also has a couple holding tracks (blue) between the arrival track and the main line, that can be used to switch cuts of cars. The yard lead (blue) can be seen in the distance along the backdrop. 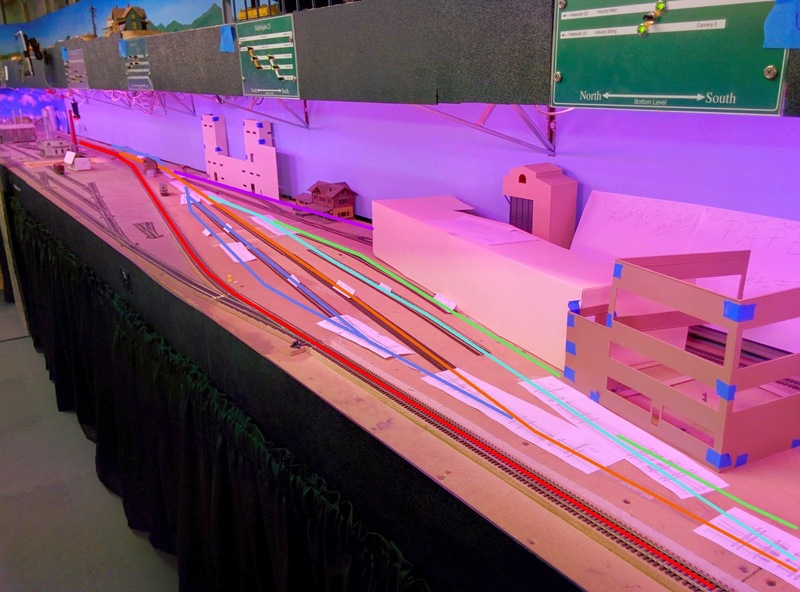 Finally, the mine spur (purple) will run along the backdrop behind (and partially covered by) paper mill buildings. Here are more detailed views of the current plan. The pulpwood yard will be served by a slightly curved spur disappearing between stacks of pulpwood. A conveyor or two will be in the background for moving pulpwood to the debarker and digester (not modeled). Of course, the various structures occupying the space of the pulpwood yard will be removed. The warehouse for pulp and recycled paper has 3 spots for box cars. One can also see the turnout off the mainline to access the arrival track from the South. A dedicated track (3 spots) is planned to unload various kinds of chemicals used in the paper making process (this mill will probably make fine paper), as well as to unload the occasional fuel oil car at a dedicated spot at the end of that track. There will likely be some office building next to the finished paper warehouse. The huge building housing the paper making machine will be represented in half-relief along the backdrop, with the mine spur hidden inside. 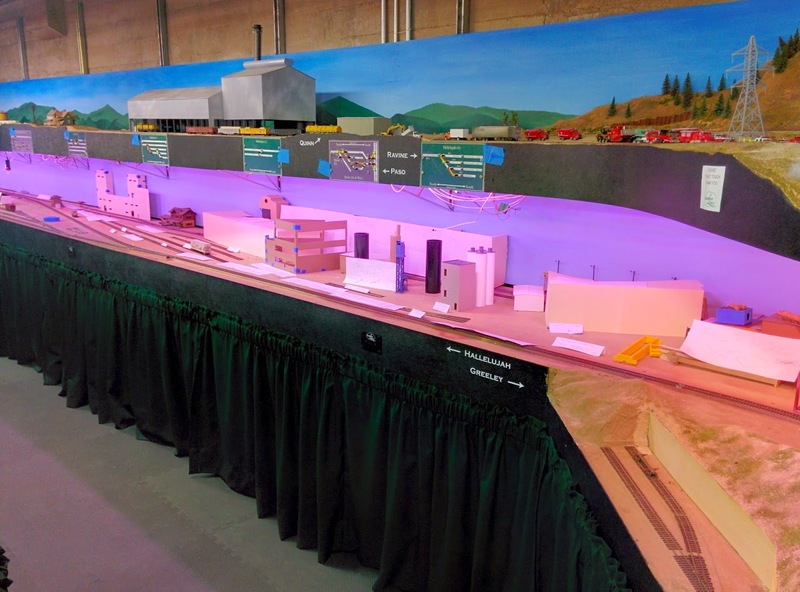 The finished paper warehouse acts as view block concealing the mine spur, and is served by a spur with 5 spots for boxcars. The yard lead crosses the mine spur and extends north between the main line and the backdrop. The large half-relief building will be removed along with the track in front of it.